The day starts with a delay in Oslo caused by sick person. A full hour go by after the time the plane was scheduled to go. This was not the worst part. The worst part was that many of us that was going to other planes in Zurich, had to be rescheduled there. Usually one would ask the other transit-planes to wait, but Swissair did not do that. For me it meant, that my plane was leaving as I came into the airport by airport-bus. I had all my luggage with me into the plane just to not miss any luggage nor plane. New plane from Zurich is 1805. After one hour at the transit-checkin, I have my new boarding pass. During this time I was thinking about Roberto Devereux in Vienna in the evening (did I have any chance to get there in time? 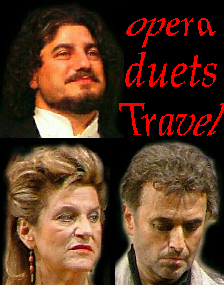 ), or take the train to Friedrichshafen (only 2,5 hours from Zurich, call my hotel, skip Devereux, call the State Opera). It would have been more relaxing maybe in the end less expensive. But when my boarding pass was handed to me, I sort of thought, "Ok then" . Bus to Westbahnhof at 1925 directly from the plane. U3 to Stephansplatz, found my hotel 20.30, 2055 I got my ticket to Roberto Devereux. This was just after act 1, it was intermission, and act 2 started 21.10. What can one say after an opera, when one seen half of it. This Sara was a wonderful, powerful voice. All praise to her!!! 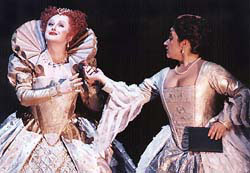 Gruberova as the old queen Elizabeth I, the end of Roberto Devereux was spectacular. Ramon Vargas seemed having slight of cold. Bravo! Carlos Alvarez, great singer, really powerful. And the winner is Enkelejda Shkosa !! !